The DC Comics Universe changed forever following their epic Rebirth event, and so did the characters. This comprehensive guide covers the latest key story lines for each character and includes stunning new images from the comics. It is also packed full of vital statistics and exp... read full description below. Is Superman the strongest Super Hero alive? Where is Wonder Woman from? Is Darkseid the most evil Super-Villain ever? Who is the fastest man alive? Who are Batman's allies? Have to know the answers to these questions? 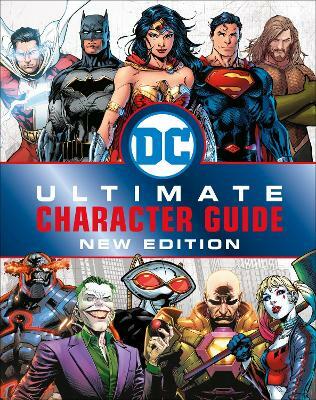 Look no further than the DC Comics Ultimate Character Guide: New Edition. Written by DC Comics experts, this illustrated encyclopedia features more than 200 incredible characters and Super Hero teams, including Batman, Harley Quinn, Justice League, and so many more. The DC Comics Universe changed forever following their epic Rebirth event, and so did the characters. This comprehensive guide covers the latest key storylines for each character and includes stunning new images from the comics. It is also packed full of vital statistics and explains each character's super powers, from indestructibility to sorcery. The DC Comics Ultimate Character Guide: New Edition is guaranteed to enthral fans for hours on end. TM & (c) DC Comics.